This was my first book by Julie Cantrell and I enjoyed it so much that I just ordered her older books (Donna review The Feathered Bone). 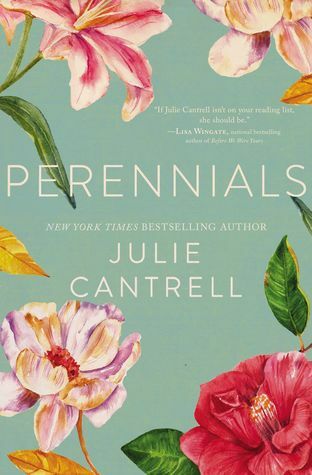 Perennials is a heart- warming story about an estranged family that is trying to become a whole family again. Plus, it has beautiful descriptions of flowers and gardens - if it wasn't winter, I'd be out planting flowers after reading it. Eva (known by her family as Lovey) is 45 years old. Right after high school, she left her home in Mississippi to make a life for herself in Arizona. She is single, very successful in her advertising career and teaches yoga to seniors on the weekends. She has been hurt by her older sister, Bitsy, and felt that her parents never took her side when they were growing up. Her parents have a 50th anniversary and they ask Lovey to come home early and spend time with them before the anniversary party that her sister is arranging. Lovey continues to be rebuffed by her sister when she tries to be friends with her again. Even when she feels that she has made progress with her sister, she turns nasty again. Bitsy even keeps her children away from their aunt. When Lovey looks at her life from an adult perspective, things look different than when she left at 18. The longer she is in Mississippi, the more she learns about her parents, her sister and most importantly about herself. This is wonderful novel about family and love and forgiveness. You CAN go home again but it's never exactly the way you remembered it from years before. Wonderful! Susan Roberts lives in North Carolina when she isn't traveling. She and her husband enjoy traveling, gardening and spending time with their family and friends. She reads almost anything (and the piles of books in her house prove that) but her favorite genres are Southern fiction, women's fiction and thrillers. Susan is a top 1% Goodreads Reviewer. You can connect with her on on Facebook, Goodreads or Twitter.